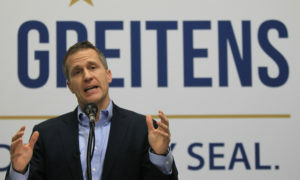 A political scientist is skeptical of President Donald Trump getting involved in Governor Eric Greitens’ future. Robynn Kuhlmann with the University of Central Missouri is responding to a St. Louis Post-Dispatch story about Trump’s administration gauging the level of support for the troubled CEO of the state by calling Missouri legislators. “At this point, in terms of the Trump administration, they’ve been I’d say fairly cautious about getting involved in things at the state level,” she says. The president faces sexual and bribery allegations by other women. Greitens has been accused of sexual manipulation, violence and blackmail by his ex-mistress. Would Trump go as far as defending Greitens? Kuhlmann is unsure but says the president has been “consistently inconsistent” in his messaging about different political issues at the national level. The newspaper report also says some legislators have reached out to the White House and others have been contacted by the Trump administration about the subject matter. Last week, State Sen. Rob Schaaf, R-St. Joseph, sent a letter to Trump urging the president to call on the governor to resign. Greitens has admitted to infidelity but denies any criminal allegations. A St. Louis Circuit Court judge is expected to decide today about a request to dismiss Greitens’ case. His legal team is accusing the prosecutor of withholding evidence. A technical glitch was originally blamed for a videotaped interview with the alleged victim not being submitted for evidence. The videotape resurfaced shortly after a House committee investigating Greitens released a report detailing the woman’s testimony.